Tactical Pro's unique frequency response amplifies signals and voices with near-perfect sound reproduction, while at the same time, instantaneously suppressing dangerous sounds without clipping. Liquid gel filled ear cushions with a folding steel band that is padded for comfort. Ergonomic 3 button touchpad. Audio jack for radio connections. 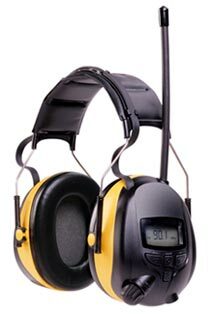 Protect your ears while keeping yourself motivated at your job site with your favorite tunes or radio programming with the AO Safety 90541 WorkTunes with digital tuning hearing protector, which includes an integrated AM/FM radio and a stereo input jack for connecting an MP3 player. 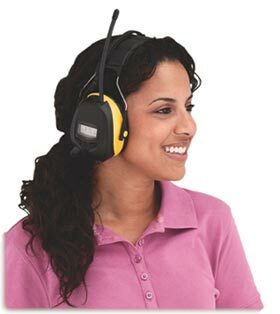 A great choice for use on construction sites (check your local regulations), in your workshop, or in your yard while mowing or blowing, the WorkTunes hearing protector offers an EPA noise reduction rating of 22 decibels. The lightweight gel/foam ear cushions offer comfort for extended wear. You'll enjoy convenient, comfortable hearing protection from the WorkTunes headset, which features lightweight gel/foam cushions that feel great even after wearing for an entire day, an adjustable stainless steel headband with padded top. Hearing protectors are recommended whenever you encounter extended periods of sound levels regularly exceeding 85 dBA--essentially, a level of noise where you feel the need to shout in order to be heard by someone just 3-feet away (see a chart showing typical sound levels). The radio and its controls are housed in one cup, and you'll be able to quickly tune to your desired AM or FM radio stations with the easily accessible seek/scan tuning buttons. Reception strength may vary depending upon location. You can also save up to 10-preset stations with a dedicated key that sits below the LCD screen, which offers a large-sized display of the radio frequency. Other controls include a combined on/off/volume control and a toggle button that switches between AM and FM radio. The LCD screen also offers a low battery indicator (see a larger schematic image of all controls). You can also connect an optional MP3 player (such as an Apple iPod), CD player or other portable devices such as a scanner via the stereo input jack (35.mm male-to-male cable not included). Additionally, the WorkTunes headset protects your hearing from both the external environment and the music you're listening to thanks to a volume control limiter that tops out at 85 dB. The radio and digital input are powered by 2 AA batteries (not included), which provide approximately 140 hours of operating time. 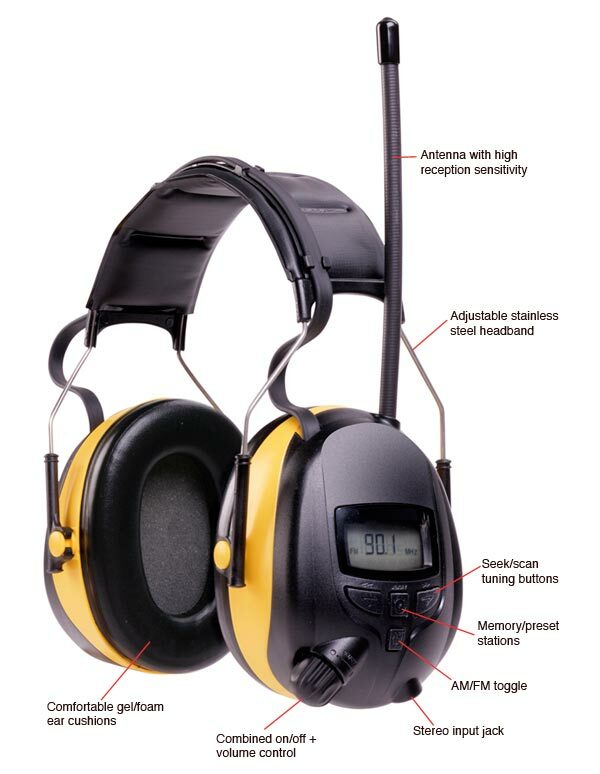 The WorkTunes hearing protector combines an AM/FM radio with digital input for connecting your MP3 player (see larger schematic image). Listen to music instead of your power tools! The built-in AM/FM tuner in these comfortable headphones now features an easy-to-read LCD display, seek/scan tuning buttons, a low-battery indicator, and the ability to pre-set up to ten different stations. Everything is designed for convenient radio browsing. For even more options, use the stereo input jack (cord included) to connect your iPod or other portable devices and scanners. Soft gel/foam ear pads and an adjustable stainless steel headband guarantee long lasting comfort. Plus, with an EPA noise reduction rating of 22 decibels, you'll receive stellar ear protection. Great for the shop or any loud environment.